I had the privilege of participating in a one week bootcamp at DesignThinkers Academy last month. 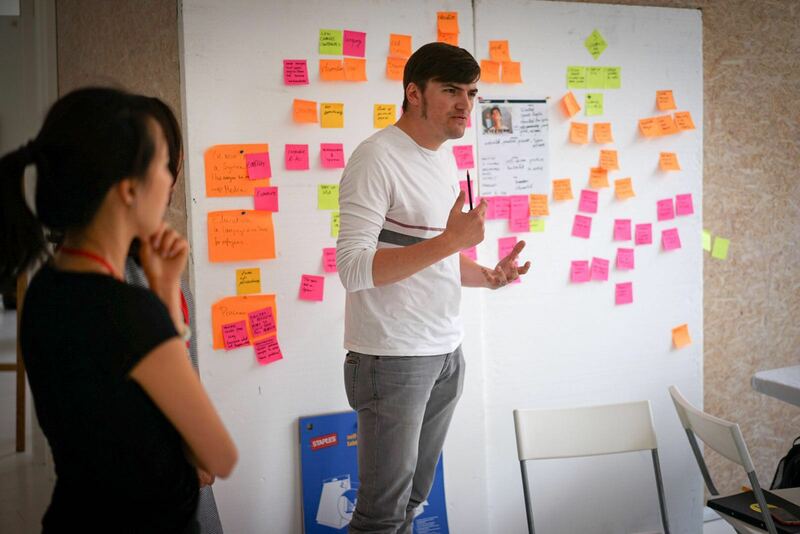 The goal of the bootcamp was to guide participants in applying Design Thinking to business via a combination of personal coaching, master classes and in-depth knowledge of service design thinking tools and methodology. Important to highlight is that the word design – to quote Steve Jobs in an interview with the New York Times – is not about how something looks or feel, but how something works. It is not just about aesthetics but about a problem solving approach. I really wanted to write about the Bootcamp experience on this blog, but I struggled a bit with how I would create the most value for you as a reader. I first thought about taking you through all the steps, step by step. However, Kartik already did such a great job in this post on medium that I wouldn’t be adding much value there. Make sure to read Kartik’s post. It’s pretty amazing. The format I’m going to use is just highlighting the biggest switches. By switch, I mean those moments when this little light switch in your head is turned on, and you suddenly see a lot more things clear. In random order, here are those switches. I had been reading and practicing both before, but only during the in depth experience at the bootcamp, I started noticing the deep links between both Design Thinking and Sociocracy 3.0. Sociocracy 3.0 or S3 is a principles based pattern library for conscious decision making, similar to Holacracy. The best example is the S3 principle of “consent”. Whereas in a “consensus” state, we only move ahead when everyone agrees 100%, the idea about consent is that we should move ahead as soon as we agree that the proposed solution is “good enough for now” and “safe enough to try”. Consent means that as long as we are not jeopardising the goal or the organisation by taking dangerous risks, or missing obvious opportunities, it is okay to move ahead. The mechanism of failing cheap and early via prototyping in Design Thinking is exactly the same. 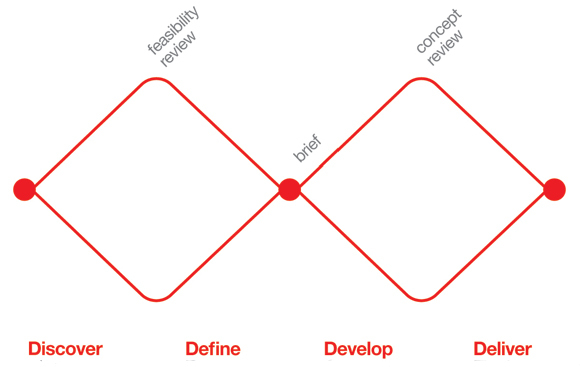 Design Thinking is about moving from uncertainty to clarity in a very conscious way. It’s about designing towards a desired outcome. The biggest failure is scoping too much too early. Exactly what happens when we try to reach consensus too early. Let’s start focussing on “good enough for now” and not trying to jump into solutions and full consensus early on in a process. You can translate that into Design Thinking easily. Basically the “clarification, reflection and response” is exactly what happens in the first half of the double diamond. Whereas falling back on previous assumptions and patterns of behaviour is what happens when you start in the second half of the double diamond without doing the first half, and go into ideation and solutions too early on in a process. David Kester stated the same during the bootcamp. Instead of first doing convergence/divergence on the actual problem, we tend to start in the middle of the double diamond. Once again, the biggest failure is scoping too much too early. The reverse dynamic was interesting as well. Whereas during the Discover and Define stages, we had to stay away from solutions, there was this intriguing group dynamic of not daring to go in solutions during the final Deliver stage. That is where the power of unlearning suddenly became clear. As a team, first you have to unlearn to jump into solutions. And afterwards you have to unlearn again and go into prototyping and testing with rough and unfinished hypotheses. The masterpiece mentality kicks in at that stage. We don’t feel hesitant to take an overscoped briefing and go into solutions immediately, but as soon as we really have to put prototypes out there in the open and confront them with reality, we’re suddenly very protective and uncertain. Design Thinking forces us to do exactly the opposite. Question the brief, take time to research and reframe the problem. And then go into rapid and iterative ideation, prototyping and testing. I hadn’t realised before that unlearning is actually the common denominator in everything that interests me. Agile and scrum are about unlearning the waterfall myth for complex projects. Lean Startup is about unlearning that we perfectly can predict if a business model will work by writing a 300 page business plan. Gamestorming is about unlearning traditional ways of doing meetings and brainstorming. Lego Serious Play is about unlearning to make powerpoint decks to solve problems. An amazing example of unlearning you MUST watch is the following movie we saw during the bootcamp. Since I started with scrum, user stories are one of the patterns in the scrum toolbox that have proven most value along the way. Focus on the user, the conditions and the outcome, in a lightweight, minimum viable way, is always good for your project. Els Dragt from MARE Research mentioned during her Master Class that during conversations as humans we only remember 25% of what we hear. Needless to say that this is exactly the reason why user stories are so valuable. You can either not document and purely rely on conversations on scope, or you can overdocument and write 300 pages without any conversation. User Stories sit in between and capture the essence of functionality, but in the meantime they facilitate conversation (where the real value lies) about that same functionality. And if you take into account that only 25% of that conversation actually sticks, you still have the user stories to capture the necessary information, without causing overhead in documentation. I am pretty fond of my Tilting the Triangle metaphor. You can only create value when you shift negative fuzz (escalation meetings, uncertainty, fear, arguments,…) at the end of a project towards positive fuzz (pulling risk in early) in the beginning of a project. Design Thinking does the same. Instead of jumping into a project based on wrong or false assumptions, you invest time and effort in deeply investigating and redefining the problem at hand. You cultivate end-user and client buy in during the project, instead of delivering something based on hypotheses. It is an end-to-end thing. Co-create value with all your stakeholders from the start. I guess I made my point by now. Lean Startup, Scrum, Lean, Kanban, Sociocracy3.0, Gamestorming,… are all interrelated to Design Thinking. It is obvious that they have influenced each other up until today, and that they will keep influencing each other in the future. The real value lies – and I’m convinced about this – in learning and practicing all these elements of that same new paradigm, which is about creativity and innovation, about unlearning, about embracing uncertainty and complexity. Don’t just stick to one method or toolbox, but open up your mind and allow these wonderful practices to cross-pollinate. Or to say it the James Victore way. Feck perfuction. Be bold and fearless. Done is better than perfect. This a great vision Bart. Thanks for sharing your point of view.